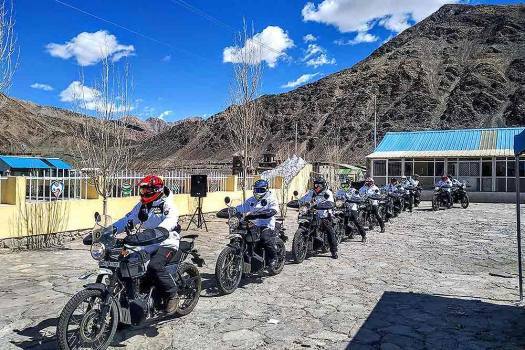 Indian Army's Himalayan Heights Winter Motorcycle Expedition team after the flag off ceremony at Karu, Leh. 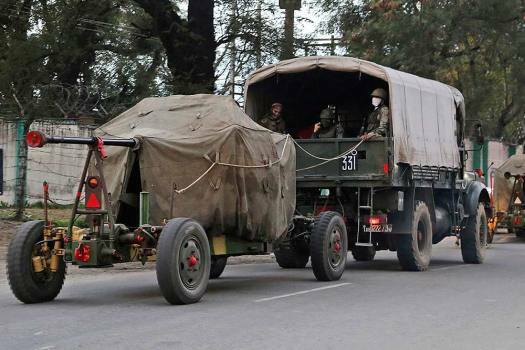 The expedition has been arranged to mark the Kargil Vijay Diwas. 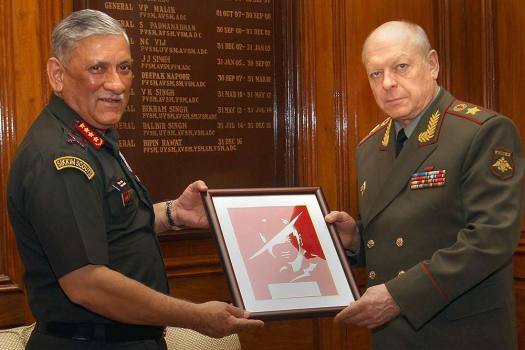 Army Chief General Bipin Rawat and Russian Army Chief, Col-Gen Salyukov Oleg Leonidovich during a meeting, in New Delhi. 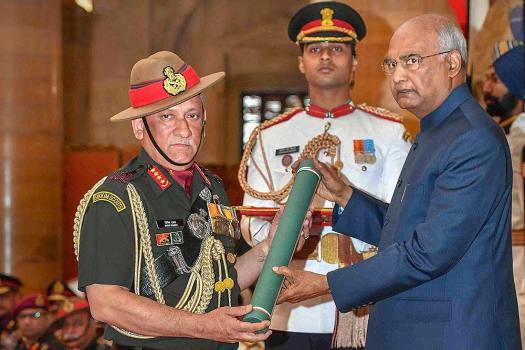 President Ram Nath Kovind presents 'Param Vishist Seva Medal' to Army Chief General Bipin Rawat during Defence Investiture Ceremony, at Rashtrapati Bhawan in New Delhi. 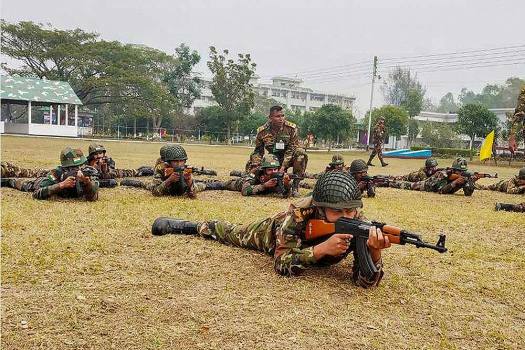 Indian and Bangladesh army troopers during a joint military exercise Sampriti 2019, in Tangail, Bangladesh. 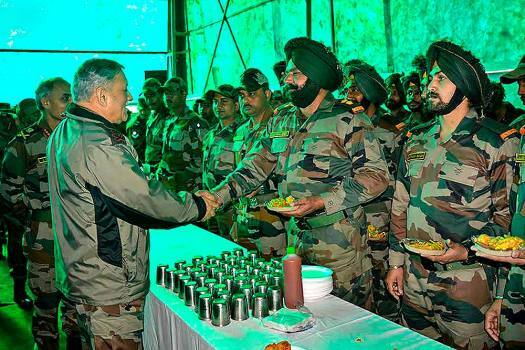 Chief of Army Staff General Bipin Rawat interacts with various army forwards in Jammu region to review the operational deployment & preparedness, in Jammu. 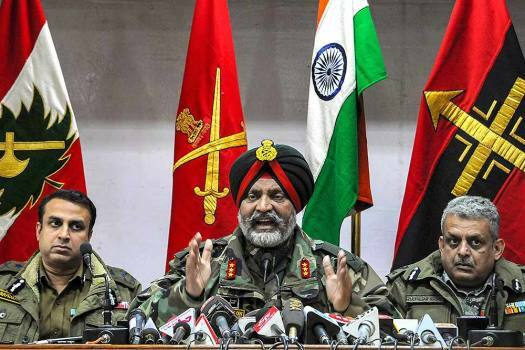 (L to R) Air Vice Marshal RGK Kapoor, Maj Gen Surinder Singh Mahal and Rear Admiral Dalbir Singh Gujral at a military press conference at South Block in New Delhi. 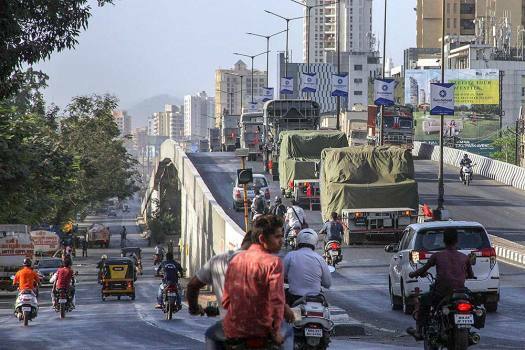 An Army convoy moves through Thane. 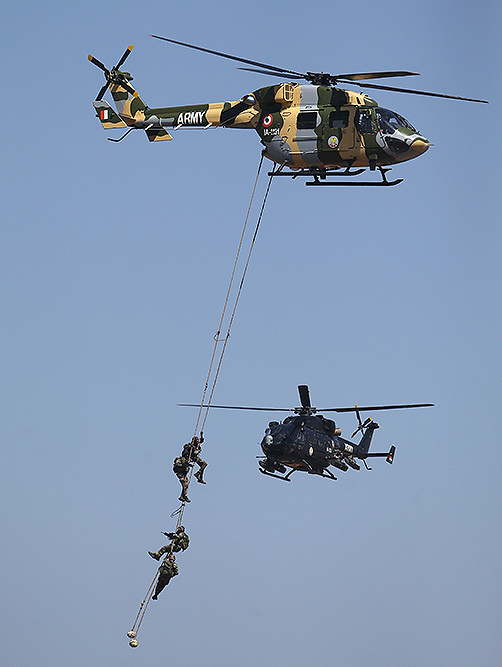 Indian army soldiers demonstrate their skills as they perform on the third day of Aero India 2019 at Yelahanka air base in Bangalore. 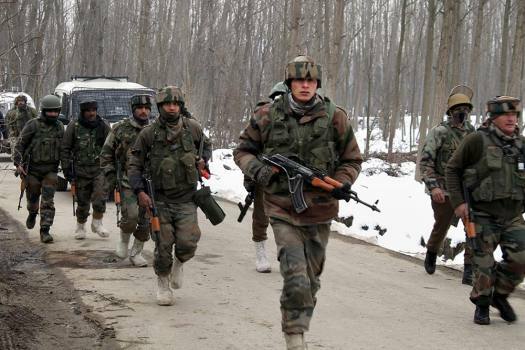 Army soldiers move towards the house where militants were hiding during an encounter in Ratnipora area of Pulwama district of south Kashmir. 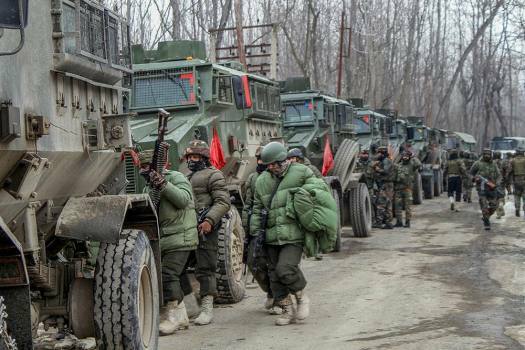 Army soldiers near the house where militants were hiding during an encounter in Ratnipora area of Pulwama district of south Kashmir. 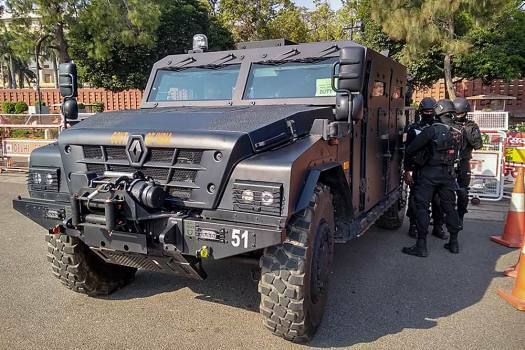 A newly acquired armoured hijack intervention vehicle 'Sherpa' deployed for security at Vijay Chowk during full dress rehearsal of Beating Retreat ceremony, in New Delhi. 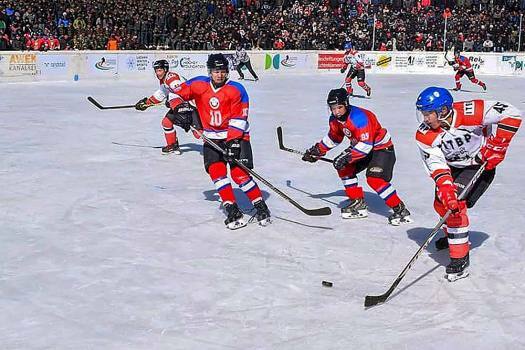 Indo-Tibetan Border Police (ITBP) and Indian Army team in action during National Ice Hockey Championship finals, in Leh. ITBP defeated Indian Army. 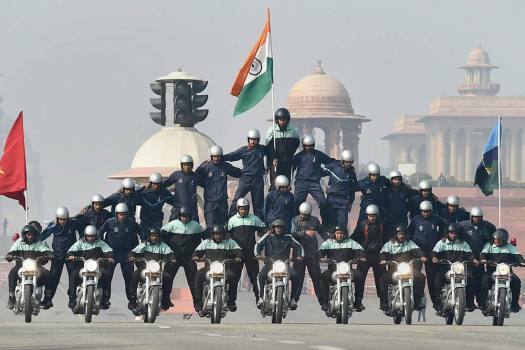 Army daredevils perform a stunt on motorcycles during rehearsals for the upcoming Republic Day parade 2019, on a cold, foggy morning, at Rajpath in New Delhi. 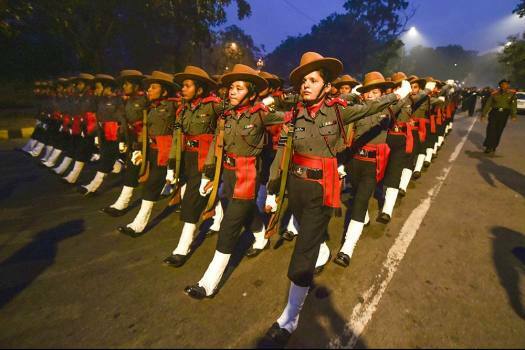 Assam Rifles women soldiers march during the rehearsals for the upcoming Republic Day parade 2019 on a cold morning, at Rajpath, in New Delhi. 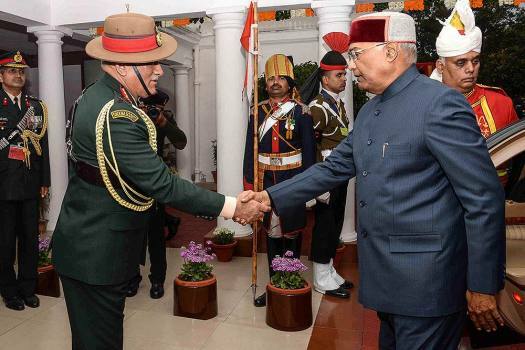 President Ram Nath Kovind greets Army Chief General Bipin Rawat at a reception on the occasion of Army Day, in New Delhi. 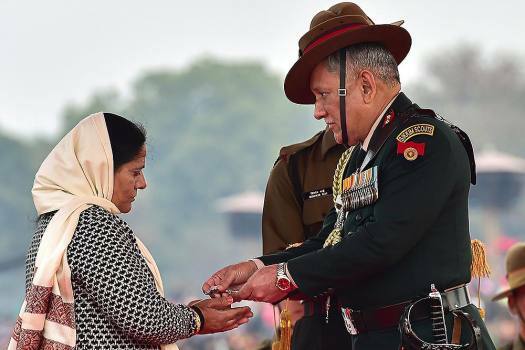 Army Chief General Bipin Rawat presents 'Sena Medal' to the widow of Shashi Kumar, during the Army Day Parade at Cariappa Parade Ground, in New Delhi. The Pakistani Army on Sunday asked India to emulate Pakistan in speaking 'truth' as it mocked an Indian legislator, claiming that the politician has copied its anthem and dedicated it to the Indian armed forces. 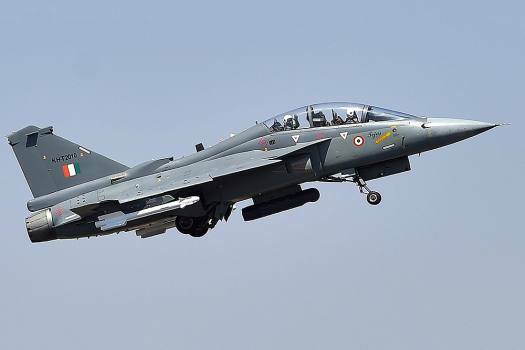 The IAF had issued a similar statement on Friday asserting that it shot down an F-16 in Nowshera sector. 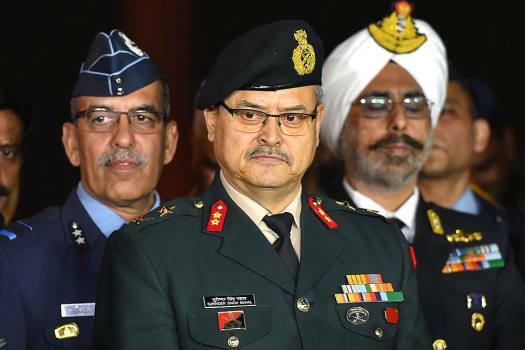 Former vice chief of army staff Lieutenant General (retd) Sarath Chand joined the BJP Saturday in presence of External Affairs Minister Sushma Swaraj. 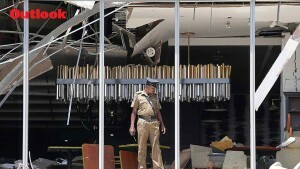 The injured soldiers were taken to a military medical facility where their condition is stated to be stable, army officials said. 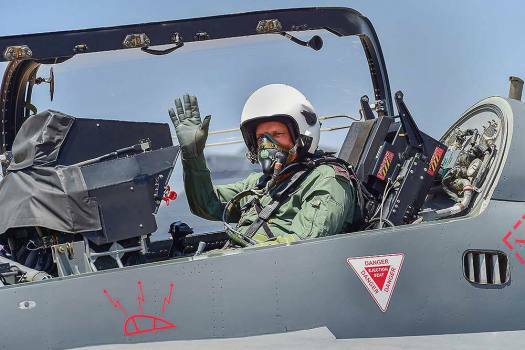 The helicopters are designed to operate from frigates, destroyers, cruisers and aircraft carriers. Ranikhet is home to the Kumaon Regimental Centre; ­almost every village in this belt has men in the army. They need no sermons on patriotism: living and dying for the country is a way of life here.